I adore meringues. Crunchy on the outside, with a chewy, sugary centre – they’re my idea of heaven! Therefore, pavlovas are right up my street. These ‘giant meringue cakes’ were named after the Russian ballet dancer Anna Pavlova, and there’s an ongoing quarrel between Australia and New Zealand with both countries claiming they invented this divine dessert. I refuse to take sides. There are many variations for topping pavlovas – the general rule is a whipped cream base topped with fruit (and sometimes nuts). 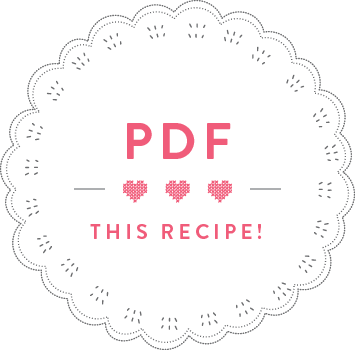 For my second book I created an amazing apricot pistachio pavlova with a rose-water cream – I still dream of that one! But, I keep on experimenting with new flavour combinations, and this one is really simple and nice, combining pineapple with mint, which is always a true winner! Preheat oven to 110 °C fan. Put the egg whites in a bowl with a pinch of salt and whip until stiff. Gradually add the sugar, then add vinegar, cornstarch and vanilla extract and beat. Put the meringue into a piping bag fitted with a star-shaped nozzle. Pipe four 10cm wide discs onto a baking tray lined with baking paper. Then, decorate the edges of the discs with small rosettes. Bake the meringues in the preheated oven for 50 minutes. Turn off the oven and leave the meringues in the oven for another 30 minutes. Whip the cream with sugar and vanilla sugar until firm. Stir in the yoghurt. Cut the pineapple into bitesized chunks. 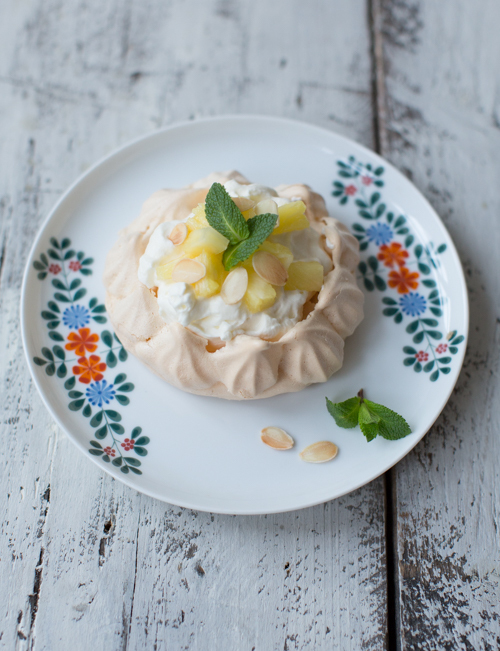 Top each meringue with a generous dollop of cream, some pineapple and mint leaves. Serve immediately. TIP: If you like this recipe, have a look at my coconut mango pavlova with cinnamon!